This exploration is for all ages, as the colored smilies show. You can do the one color paintings with your whole family together! One color paintings are an art project that is a terrific companion to Unit 1-12 in which you learn about color as one of the elements of art. Layers of Learning has hands-on art projects in every unit of this family-friendly curriculum. Learn more about Layers of Learning. Color is one of the basic elements of art. Whenever we view art, we are affected by the colors within it, whether we realize it or not. Colors spark emotions. Artists play and experiment with colors and the emotions they evoke. Pablo Picasso was a famous painter who played with color. He is most famous for his cubism, but before he painted in that style he went through his “blue period.” He focused on painting images that were lonely or sad, and he used the color blue to help express those emotions. Click here to check out PabloPicasso.org and view the self-portrait he painted during his blue period. Everything in the portrait is a various shade of blue. Even his skin has a blue tint to it. His colors make the portrait seem sullen and forlorn. Before you begin exploring, read a book or two about color. Here are some suggestions, but if you can’t find these, look for books at your library about color. The colored smilies above each book tell you what age level they’re recommended for. For this art project, you’ll need art paper, lots of crayons, and watercolor paints. When you’re done drawing, paint over the whole thing using watercolor paints. Choose a color that you want to have as the focus for your picture. You’ll be using a monochromatic color scheme, which means you’ll only be using one color, but within each hue there are many tints and shades. Gather all the crayons of that one hue that you can find and use them to draw a simple picture of one item. You can use a how-to-draw tutorial from the internet if you want help with your drawing. Make sure to incorporate the various tints and shades of your color in your drawing, but also leave white space in places too. You’ll be painting later and you want to leave some areas for the paint too. Once you’ve finished coloring your picture, it’s time to paint. You can mix watercolor paints and play with the amount of water to make it either lighter or darker as you go. The more water you use, the lighter the paint color will be. More paint will create a darker hue. You can even mix several hues together to get even more shades and varieties within a hue. Once the picture is completely covered with paints, let it dry. You may even want to mount it on a sheet of matching card stock or construction paper to carry the tone of the painting even further. Show off your one color paintings to an audience and tell them what you drew and the various tints and shades of the hue you used. Describe some words that go along with your color. 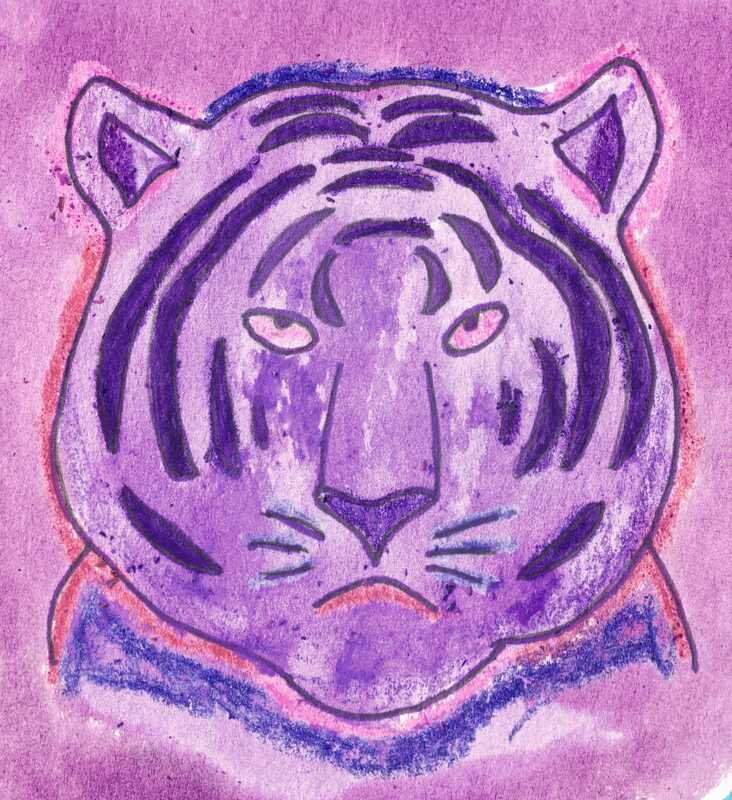 For example, when I look at the purple tiger, I think he is majestic, dark, brooding, powerful, and grand. Talk about colors and what each color symbolizes and communicates to you personally. Tell how you think it changed your picture because you used a monochromatic color scheme (just one color). Besides Picasso’s “blue period,” he also had a rose period in which he used warmer colors. Did you notice that the tone and emotions in your paintings differed depending on whether you used warm or cool colors? Write about how warm colors (red, orange, yellow, brown) make you feel and about how cool colors (green, blue, purple) make you feel. As you’re painting over the crayon picture, you can also talk about how you are making a wax resist painting. The wax of the crayon resists the watercolor paints and won’t really stick there. The watercolors only fill in the spots in the areas you didn’t apply crayon wax.